This is a bit tangential — which is pretty normal for my contributions — but whenever I think of Flint and its decline I think of something which happened to me about 25 years ago. When I was a kid my Mom worked as a bookkeeper at a family-owned shoe store downtown. When the owner finally "packed it in", for good, her told her she could have anything she found in an upstairs warehouse. She brought home a box full of periodicals and newspapers that were from the late 19th century and which were in pristine condition; it was really a treasure-trove of historical documents. I was a nerdy kid and loved pouring over the material. One item was a newspaper from Tonapah, Nevada circa 1867, or something like that. It had a huge headline that read, "Tonapah Population Hits 200,000" with a picture, looking down on the bustling city, taken from an adjacent mountainside. The tone of the accompanying article was that, thanks to the mining industry, Tonapah's future looked so bright that — to paraphrase — everybody had better be wearin' "shades" (well, some 19th century version of that idea, anyway). Life was good, in Tonapah, to say the least. Then, in 1986 I was a musician working in Las Vegas. The band I was with landed a gig in Reno so we made the long drive north; the planets had aligned and I finally would get to see Tonapah, Nevada with my own eyes. It was so incredibly odd because I had gazed at the picture on the front of that newspaper so many times. As we drove through Tonapah in 1986 the population was down to only a few thousand people (as I recall) and, mostly, it was a collection of abandoned and collapsing buildings whose windows were missing and whose doors simply banged in the wind. And the homes and stores which did remain occupied were run-down, dirty, and the entire town had a depressing and repellent quality. We got some gas and I was anxious to just get of Tonapah. I was profoundly impacted by the degree to which the once thriving city had simply expired. Back in 1986 I wondered about the families in that community. What had it been like to watch that city die? Now I know; my old hometown has gone precisely the same way. That Flint might ever rebound in a meaningful way is improbable on the order of the Biblical resurrection of Lazarus — it's not gonna happen. It's over, folks. In the same way that time has forgotten about Tonapah, Nevada, so will it be with Flint, Michigan. 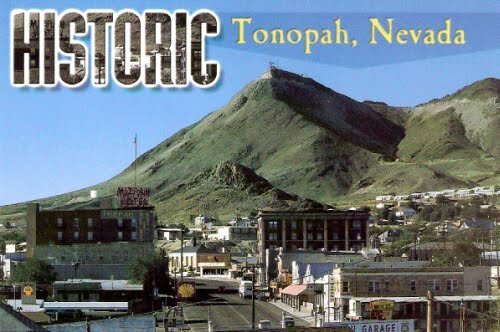 Tonopah of course was truly a one-industry town; practically no economic activity there wasn't related to generating or re-distributing revenue from mining. Flint is way smaller as an auto town, but it's not gone. The truck complex rolls on, with good prospects. And, Genesee County does have economic sectors that aren't fed by auto-sector revenue: colleges, farming, the Mott Foundation, non-automotive-related manufacturing, provision of miscellaneous goods and services to people whose income doesn't come from the auto industry. Genesee County also is quickly enough linked by road to workplaces to the north and south, and the east and west to lesser extents, that some folks live here and work elsewhere. Certainly it's inevitable that economic and physical contraction will continue as jobseekers and auto retirees depart. Certainly the City of Flint will cease to be the center of governmental decision-making in the County, as the impacts of social ills and housing stock degradation continue. It's implausible, though, that Genesee County as a whole will go the way of Tonopah. We're economically diverse enough to prevent that. Interesting story but pretty drastic opinion, comparing Flint to a place with "doors banging in the wind". Flint may never be a huge metropolis again, but who says it says it has to be, in order to "rebound in a meaningful way". And, commenting upon my own drivel, I often wonder how that perfectly preserved newspaper from Tonopah, Nevada (printed in the late 1860's) came to be in a box in the upstairs warehouse of Elliott's Shoe Store in Flint, Michigan. It was about 1975 when my Mom brought all of that stuff home. And was I so captivated by that particular item? For one thing, literally it looked as if it could have been printed the previous day. Some sort of divine tip off - who knows...? My brother and I are Flint expatriates. This summer we took a city-wide tour to see if anything changed lately. Wow. Flint sure has. We were stunned to see the many empty lots where houses used to be. See for yourselves with the street view on google maps. In particular, scroll around the corners of Root St. & E. Wood St. It looks more like a lonely country road. I can see their version of the Durant in the postcard. This little Nevada town looks rather pleasant. Becoming a small town with a low crime rate that no one's heard of in 100 years wouldn't be the worst fate for Flint. Yeah, anonymous, my dad grew up around Williams and Chippewa and I haven't physically been by there in years but I looked it up on Google Earth after being inspired by Austin McLogan's photos. There is literally two houses between Saginaw St. and Root St on Chippewa. I would never guess this was in the middle of the city. So sad. I suspect that my somewhat "apocalyptic" view of Flint's situation has a strong correlation to to the area in which I currently live (Flint's East Side). In regards to what I wrote - and I don't mean this an acrimonious way at all - I didn't endeavor to write an "interesting story.....". I'm not that darned creative, nor, gifted as a writer. Honestly, I just always think of Tonopah when I look at Flint, now. And I do take issue with the proposition (not the person - I hate internet bickering) that Flint has anything on the order of a "diversified economic base...". In fact, that's precisely the problem - and something which I am always talking about in my conversations with friends, customers, etc. Flint has never had anything which remotely resembled a truly diversified economic base. Lansing, as a comparison, is the seat of State government, the home of a Big Ten University, the home to some large and successful software companies - and on and on. Flint, as the old saying goes, was a one-horse town. That horse was GM, and, it bolted from the stable a few years ago - and hasn't really been seen, since. The issue here, as with most issues which pop up for public discussion, is that "we're all standing in our own shoes...". I live in an area where many, many doors are already "banging in the wind" - well, the ones that aren't on fire. Hope, in the area in which I live, is in incredibly short supply. That's not hyperbole - that's reality. That's not an "interesting story" or some dismal abstraction - that's the Flint in which I live and work. And I suspect that it will grow worse (I really think it could surprise people). And - oddly enough for someone who like to think he's reasonably bright - I really hope that I am completely wrong about all of this - honest! Will Flint be reduced to the sort of "dust" that is now the lonely outpost of Tonopah, Nevada - probably not...exactly. Tonopah will remain located in Nevada and Flint will still be in Michigan (just some comic relief so that I can go to bed feeling better!). Guy, I agree with you on the coverage of Flint is often folded into a certain story or narrative. That's often the way it works and it never tells the full story. As someone who visits Flint but no longer lives there, I fluctuate between hope and hopelessness. There's no denying that when you drive down Jane Avenue, then do even a small amount of research into Flint's fiscal reality, you're often left wondering how the situation can ever improve dramatically. Then other times I think things have bottomed out and are starting to get better. Then the fires start and the serial killer emerges, and you realize things can get worse. It's a hard situation to get a handle on. Thanks for commenting. Everything depends on your gestalt regarding "Flint". If you think of "Flint" as defined by its City boundaries, with everything else in the County discounted as dependent bedroom suburbs and feeder economies, then "Flint" is a catastrophe. If you think of "Flint" as a metro area encompassing most of the County, then the concentrated physical and social decay of the oldest parts of the central area is unfortunate, and perhaps something to be stayed away from because of the crime aspect, but life goes on. The central area may have decayed, and a number of jobs may have left, but other communities within the metro area are still viable and economically vibrant. It's a more sellable *national* news story as seen from the catastrophe-gestalt perspective, of course, because (per classic journalism practice) reading about how bad someone else has it will always appeal to a population that mixes liberal empathy and schadenfreude. Yes, people who know nothing about Flint are drawn to stories about the plight of the city. They probably aren't as interested in the less dire story of the county itself, where places like Grand Blanc and Flushing are now having problems, but are healthy and vibrant compared to the city of Flint. There's no doubt that the more complicated the story is, the tougher it is to write and the tougher it is to sell to readers. Unfortunately, the U.S. has never really embraced regional planning. It will have to eventually, I think. If you let Michigan's troubled cities just die, they will drag down the entire state's economy and budget. I can tell you for a fact that many areas of the country are exhibiting negative events that you used to mainly see in Flint and other factory exported towns. There is a particular Schadenfreude that is exhibited by long time residents of such cities as Ann Arbor and Grand Rapids who resented the success that Flint had back in the 1950s and 1960s. All I can say is, you better hope that things improve fast or it's headed to a city near you. I for a fact remember people from such cities saying that ther reason Flint has suffered is that the people are stupid. Then they started exporting high tech jobs and bringing in people under special visas that also displaced American jobs. My final thought on all of this and, actually, it's a bit off topic (what else is new with crazy 'ol Guy?). Gordon: I really enjoy this site and your consistently fair-minded and thoughtful insights/observations. I have but one request. The next time you're visiting Flint, Gordon, DO NOT DRIVE DOWN JANE AVE.! That is a temptation which I strongly encourage you to resist. There is never a good reason to drive down Jane Avenue. Do something safe - like become embedded with an infantry division in Afghanistan. Guy, I not only drove down Jane, I walked up and down it from Franklin to Lewis. Twice. Didn't see another person either time, except for a guy who told me it wasn't a good idea to walk on Jane Ave. But I'm not exceptionally bright, and I was taking photos for Slate. I think I'll take Flint over Afghanistan, but thanks for the advice. That's dedication to your craft...... But I agree with the one guy you ran in to on your walk.... How funny. I swore I wouldn't comment again - but I'm in a 12-step group for pathological lying. I only had one customer all day so I goofed off by assembling a site/page which might explain why I have such a negative view of Flint and such a pessimistic outlook. I reveal a little more of my personal life than many people would regard as prudent. At 58, I guess I just don't care. I've goofed up pretty badly, but, I think I've turned into a pretty nice old fart. As you'll see, a lot of my pessimism is arguably the consequence of some very bad personal choices and a bad personal situation. In fact, I'm not sure that Gordon would want to provide an external link of this kind - but this is the Flint that I know....this is the north of end of Arlington Ave. over about an 18-month period. This is Flint as seen through the prism of my own, personal situation (and, therefore, it might be meaningless and/or inappropriate here).